AUCTION LOCATION: 16200 GARFIELD AVE. PARAMOUNT, CA. 1998 Haas HS-1 4-Axis 2-Pallet CNC Horizontal Machining Center s/n 50587 w/ Haas Controls, 24-StationATC, CAT-40 Taper Spindle, 7500 RPM, Thru Spindle Coolant, Brushless Servos, Rigid Tapping, Quick Code, 1mb Extended Memory, Macro Code, Coordinate Scaling, Chip Augers, Hand Wheel, (2) 15 ¾” x 15 ¾” Pallets, (2) 10” x 10” x 22” Tombstones, Cool Jet Systems Coolant Filtration and Cooling System. 1998 Haas HS-1 4-Axis 2-Pallet CNC Horizontal Machining Center s/n 50488 w/ Haas Controls, 24-Station ATC, CAT-40 Taper Spindle, 7500 RPM, 4 th Axis Thru Pallets, Rigid Tapping, Quick Code, 1mb Extended Memory, Macro Code, Coordinate Scaling, Hand wheel, Chip Augers, (2) 15 ¾” x 15 ¾” Pallets, (2) 10” x10” x 22” Tombstones, Cool Jet Systems Coolant Filtration and Cooling System. Mori Seiki LL-7 40” x 144” Big Bore CNC Gap Bed Lathe s/n 184 w/ Fanuc System 6T Controls, 8 ½” Thru Spindle Bore, (2) 4-Position Tooling Turrets, Hydraulic Tailstock, Steady Rest, Sliding Pendant Controller,28” 4-Jaw Main Chuck, 23 ½” 4-Jaw Rear Chuck, Coolant. 1991 Femco WNCL 35/100 CNC Turning Center s/n 1043 w/ Fanuc Series 0-T Controls, 12-Station Turret,Hydraulic Tailstock, 12” 3-Jaw Power Chuck, Coolant. Hardinge mdl. HC Hand Chucker s/n HC-1207- D w/ Threading Attachment, 125-3000 RPM, 8-Station Turret, Power Feeds, 5C Collet Closer, Coolant. Clausing mdl. 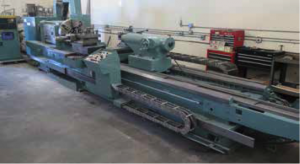 5913 12” x 38” Lathe s/n 501040 w/ 52-2000 RPM, Inch Threading, Tailstock, 5C Collet Closer. Ikeda mdl. RM-1300 13” Column x 40” Radial Arm Drill s/n 77240 w/ Power Column and Feeds, 18” x 21 ½” x 20” Riser Tooling Block, Coolant. Boyar Schultz mdl. 612-H 6” x 12” Hydraulic Surface Grinder w/Magnalock Electromagnetic Chuck. Clausing 2-Head Gang Drill Press w/ mdl. 2233 5-Speed Heads, 300-2000 RPM, 24” x 39 ¾” Table. Rockwell mdl. 17-600 Variable Speed Pedestal Drill Press. Powermatic mdl. 87 20” Vertical Band Saw s/n 487301 w/ 24” x 24” Miter Table. Grob mdl. 4V-18 18” Vertical Band Saw s/n 2420 w/ Blade Welder, 40-5000 FPM.